Home » Halloween: The Curse of Michael Myers Actually Isn’t a Bad Film: Here’s Why! Halloween: The Curse of Michael Myers Actually Isn’t a Bad Film: Here’s Why! Every once in a great while, a horror film is released that is universally embraced by fans from all walks of life. From the superb writing, visionary direction and stellar acting, it becomes an instant classic and widely revered in horror circles. Halloween: The Curse of Michael Myers is not one of those films. However, The Curse of Michael Myers is also not without its collective merits. And that’s exactly the point I plan to prove here. With the excitement for the newest Halloween film that sees Jaime Lee Curtis returning as Laurie Strode and Nick Castle reprising his role as The Shape, fans are tearing their hair out waiting for the latest installment in the series and finding a renewed interest in all things Halloween. I, too, have developed a renewed interest in the Halloween franchise. And, accordingly, I began going back and revisiting Haddonfield. During my stroll down memory lane, I rewatched Halloween The Curse of Michael Myers. The film was released in 1995 and is the sixth entry in the series. It was universally panned by critics and fans alike for a confusing storyline and lackluster acting. It currently holds a 6% approval rating from critics and a 38% favorability score from audiences on Rotten Tomatoes. After 23 years, I think it’s time to view Halloween: The Curse of Michael Myers through a fresh set of eyes. After revisiting the film and also checking out the famed Producer’s Cut (which we will discuss later) I’ve arrived at the conclusion that Halloween: The Curse of Michael Myers is not the trash fire it’s frequently made out to be. I like to refer to this entry as the last in the Jaime Lloyd trilogy which we saw begin in Halloween 4: The Return of Michael Myers. The Curse of Michael Myers opens on Halloween night with a woman giving birth to a baby in what appears to be an underground cult ceremony. We learn that the women is Jaime Lloyd. Recasting the role was a point of dissatisfaction with many viewers as fan favorite Danielle Harris was replaced by a new actress. I can certainly understand the disappointment, but if you can move past the decision to recast the role, there are valid reasons to like this film. The basic plot of the sixth installment revolves around Jaime Lloyd’s baby and the key to uncovering Michael’s blood lust which can be traced to an ancient rune known as the Curse of Thorn. After Jaime escapes with her baby from the confines she has found herself in, Michael is hot on her trail. Jaime gets away in a stolen pickup truck and finds herself at the creepiest and most abandoned bus depot in horror cinema history. She manages to call into a shock jock radio show hosted by Barry Simms and warns them Michael Myers is returning to Haddonfield while pleading for Dr. Loomis to help her. Although it’s an unpopular opinion, I believe that Halloween: The Curse of Michael Myers is not a bad film. In fact, I think it’s a much more solid entry than people give it credit for. One of the things that works so well about this installment are the subtle nods to the original. For example: When Tommy meets Danny for the first time he is carrying a pumpkin home from school. Danny runs into Tommy and drops and breaks his pumpkin. Obviously, this is a nod to the scene in Halloween where Tommy was tripped by bullies and smashed his pumpkin on the sidewalk. It’s gestures like this one that make me see this film as more than a cash grab sequel. Writer Daniel Farrands cites his love for the Halloween series as an inspiration for his screenplay. Farrands even attempted to tie up some loose ends in The Curse of Michael Myers. Such as the strange Thorn symbol and the Man in Black which were never explained in H5. I also have a soft spot for this flick because it marks the last appearance of Donald Pleasance as Dr. Sam Loomis. Pleasance passed away shortly after principal photography for the film was completed. And the feature was subsequently dedicated to him. Dr. Loomis was one of Michael’s most worthy adversaries and seeing the good doctor go up against the shape for the last time is part of what makes this film special to me. The film is also noteworthy for taking Haddonfield and the mythos of Michael Myers in a whole new direction. This entry expands on the why and how Michael is able to do the things he does. Some of the explanations were a little misguided but the filmmakers still deserve credit for making an effort to provide answers. A big reason why the theatrical version of the film seems a little discombobulated can be attributed to poor test screenings. As a result, Dimension Films ordered reshoots. The reshoots led to the confusing story line we all know. The death scene of Jaime Lloyd and even the ending were redone. According to IMDB the editing, re-shooting and problems on the set led to many people associated with the film disavowing their involvement. Disagreements between the director, producers, and Dimension are all responsible for the final theatrical version of the film. Enter the Producer’s Cut of Halloween: The Curse of Michael Myers. This version of the film is more in line with what the filmmakers were trying to accomplish. Upon its release, fans were finally able to see what the producers had wanted viewers to see all along. I picked up a copy of the Producer’s Cut last week. And I immediately sat down and gave the film my undivided attention. This version contains over 70 minutes of deleted footage and the original ending. After it was over I was grateful I had invested in a copy. It was like watching a whole different movie. One of the stark differences between the theatrical cut and Producers Cut is Jaime Lloyd’s death. In the theatrical version, she is taken out via a corn thresher. In the Producer’s Cut, Jaime survives for most of the first half of the film. She finally meets her untimely demise at a hospital. It’s nice to see more of this fan favorite character in this alternate version. The original ending is another obvious change. 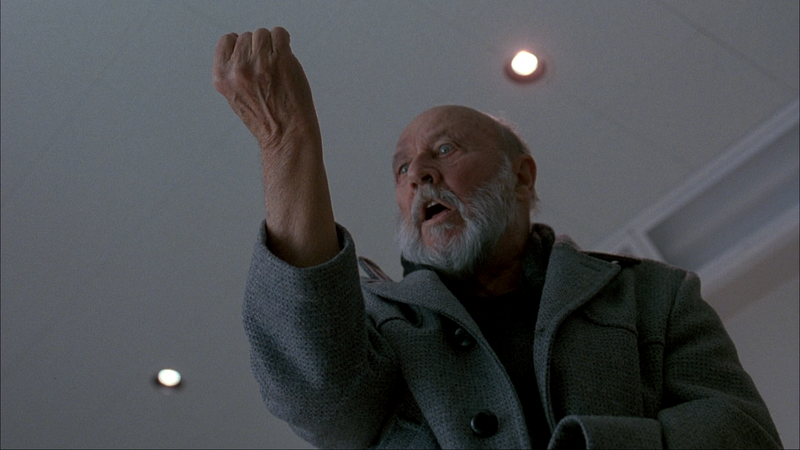 In the theatrical version, the climax at Smith’s Grove finds Dr. Loomis now afflicted with the Curse of Thorn. He bears the Thorn tattoo on his right wrist like Michael. In the end does Halloween: The Curse of Michael Myers have its flaws? Absolutely. But that doesn’t mean this film should be skipped during a series binge. It is entertaining and has some amazing kills at the hands of Michael. Not to mention, some of the characters are insufferable, which leads to much delight in watching them taken out. For example: There is a particularly memorable scene where Kara’s abusive father meets his maker by way of a fuse box in the basement. During electrocution his head explodes. Upon first viewing this film I could not wait for him to get what was coming to him and his death did not disappoint. I implore you as we prepare for the Shape to slash his way across the silver screen once more to keep an open mind and give this one another shot. And if you haven’t seen the Producer’s Cut, pick up a copy. Hopefully you will be pleasantly surprised upon doing so. Hailing from the great state of Ohio, Aaron Posey was raised on a steady diet of Ghostbusters, Unsolved Mysteries, and classic slasher films. He possess a plethora of useless horror knowledge that he is dying to unleash on the world. He can carry on a conversation using nothing but movie quotes and can liken any situation to an episode of The Simpsons. He is always on the lookout for up-and-coming horror related bands and music. His crowning achievement in life is his brief appearance in the Halloween: 25 Years of Terror documentary.